I bought these wheels to put in my moms Walker in the back legs. I tried the balls and different glides but nothing worked good for her. She had a hard time pushing the Walker and walking with it. She was so use to a stroller like Walker that freewheeled more so these were perfect. Now she has four wheels and can maneuver her Walker much better and is one happy lady. My husband had to use a walker after having emergency back surgery and the rubber tips for the back of the walker or the cut out tennis balls don't fair very well in the great out doors, so I purchased another set of wheels and added them to the back legs so it was easy going not only inside, but also outside use as well. These 5 " wheels are great. They go over cracks in the sidewalk and uneven pavement easily. Because my walker needs new wheels. as a replacement - would have preferred 8" wheels for transport chair, if these work will order 2 more. I use my walker all the time and.I hope all wheels will improve its usage as claimed by others who have converted to 4 wheels. I need mobility in my home. My current walker doesn't have wheels. reworking two other walkers. So glad I received your catalog! Needed them for a walker that didn't have wheels. For easy use over carpet and other uneven areas. If these work I plan on getting another set for the back of my partners walker. WILL THESE WHEELS FIT A HEMI-WALKER? BEST ANSWER: Thank you for your question. 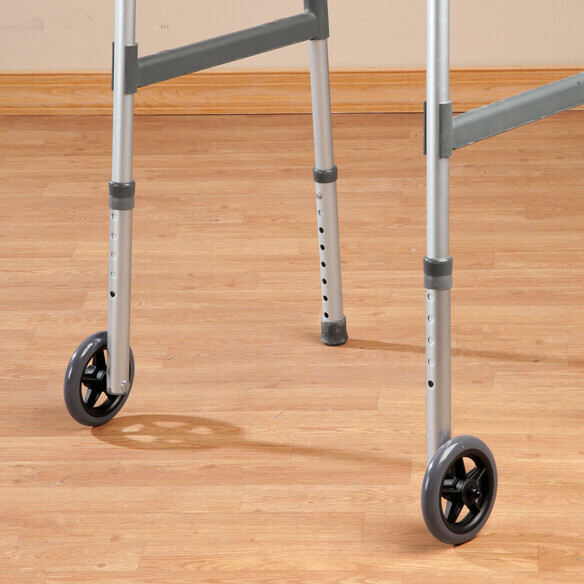 These walker wheel are designed to fit most standard 1" diameter folding walker legs. We do suggest measuring your walker legs before ordering. We hope this information will be of help to you. Yes. Little difficulty getting old ones removed, but these went on easily.